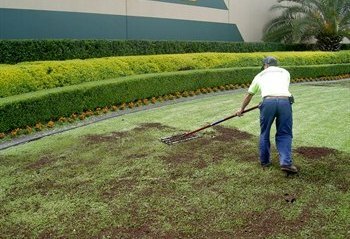 Top dressing is the process of applying compost over the surface of your lawn. Good soil is living soil. In nature, soil microbes enrich soil by converting fallen leaves and other debris into nutrients grass can use. Top dressing is simply a way of restoring that balance to your home lawns, building good soil and increasing the amount of living material in your soil. Below is a list of some of the benefits of topdressing lawns. can build up the soil flora. along with core aeration, can help to change soil structure. can help reduce lawn diseases. can help relieve compaction problems. can help reduce the need for fertilizer.